George Galloway's radio show breached impartiality rules during discussions on the Labour Party and anti-Semitism, a watchdog has ruled. On his show, he said anti-Semitism claims against Jeremy Corbyn were "bogus" and had materialised because of the Labour leader's "success". Ofcom found two TalkRadio phone-in shows "failed to give due weight" to a "wide range of views" on the subject. 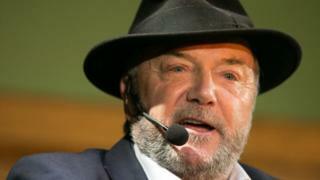 Former MP Mr Galloway said public money had been wasted on Ofcom's inquiry. TalkRadio said it accepted Mr Galloway "crossed the line... on this occasion". Ofcom is considering "the imposition of statutory sanction" over the "serious breaches", which could include a fine. Mr Galloway's show previously breached impartiality rules when discussing the Salisbury poisonings. Ofcom investigated Mr Galloway's shows on 27 July and 6 August after receiving one complaint for each over impartiality. One listener complained that the 27 July programme had been "completely" biased about claims of anti-Semitism in the Labour Party. While another complained there had been nobody featured in the 6 August programme who disagreed with Mr Galloway's views on anti-Semitism in the Labour Party. Ofcom said Mr Galloway, an ex-Labour and Respect MP, had made "frequent statements" that had been supportive of Mr Corbyn and concerned various criticisms of the leader in relation to anti-Semitism. During his show, Mr Galloway said "on one level" the anti-Semitism accusations surrounding the Labour leader had been "because of Jeremy Corbyn's astounding success". He described the claims of anti-Semitism as "an onslaught" launched at the precise moment Mr Corbyn's polling had improved and said this was about "destroying Jeremy Corbyn's potential to be Britain's prime minister". Hosting phone-ins, Mr Galloway called the sender of a text who disagreed with his views an "ignorant woman" and another a "gutless coward". "Our investigation found that these phone-in programmes breached our due impartiality rules," an Ofcom spokesman said. "They failed to give due weight to a sufficiently wide range of views on allegations of anti-Semitism within the Labour Party." Image caption George Galloway said "on one level" the anti-Semitism accusations surrounding Jeremy Corbyn had been because of the leader's "astounding success"
In response, Mr Galloway said Ofcom should be "investigated for this quite scandalous waste of public money purchased by a single complainant". "I am proud of my performance on this particular radio show," he said. "The people who should be ashamed are Ofcom and its single complainant." A TalkRadio representative said: "You expect robust opinions from George Galloway but we accept that on this occasion he crossed the line. "As a station we understand the need for dissenting voices with a range of counter-opinions."